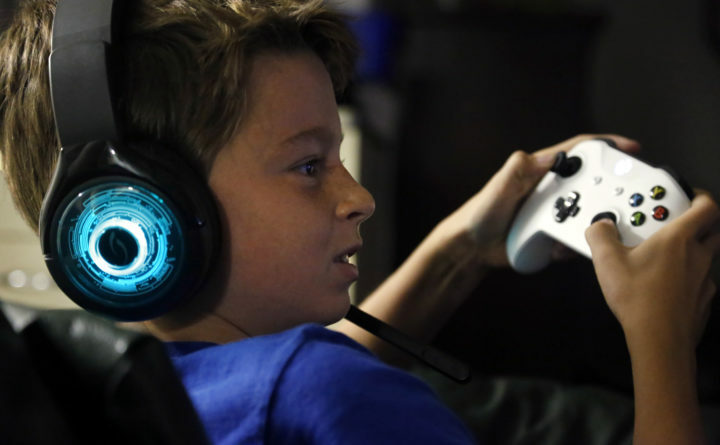 Henry Hailey, 10, plays the online game Fortnite in the early morning hours in the basement of his Chicago home, Oct. 6, 2018. A flaw in Epic Games Inc.’s Fortnite opened the accounts of millions of users to the risk of a malicious attack, researchers from Check Point Software Technologies Ltd. said in a report Wednesday. The vulnerability in the authentication process allowed hackers to send a link to the player that, once clicked, gave access to user accounts to buy virtual currency and purchase game equipment that would then be transferred to a separate account and resold. The hacker also had access to conversations held by the player and his friends, which could be used to exploit the account owner, often children under 18. Epic Games recently fixed the flaw, the Israeli cyber security company said. Epic Games could not be immediately reached for comment but has a patch that offered new weapons and bug fixes detailed on its site. It is unclear whether the vulnerability was ever exploited. “Needless to say, that along with this massive invasion of privacy, the financial risks and potential for fraud is vast,” Check Point said. The company’s head of products vulnerability research, Oded Vanunu, said his 6- and 9-year-old children play Fortnite, as do millions of school children around the globe. As of June, Fortnite had been played by 125 million people, and was on track to generate $2 billion for Epic Games. The game revolves around a cartoonish, last-character-standing battle where players fight for weapons and resources. It’s free to play and available on multiple devices from mobile phones to video-game consoles.